What did you love best about First, Impressions? This story never takes a break! It will keep you guessing and throw a curve ball at you every other page.The characters are very compelling and well written, especially Claire's main companion Glyph. The developing relationship between Claire and Glyph really grounds the story and keeps it moving. Although scenes constantly skip from present to past, none of it seems deluded or forced. Every scene from the past seems to add some sufficient value to Claire's character. The context of her past relationships effectively support her relevant goals in the present, so it's easy to sympathize and relate to what she's doing and what she wants. Action is abundant and clear cut. The action scenes don't feel forced or irrational. A sense of danger is evident, but so are Clair's talents and her will to survive. Still, she is put to the test on multiple occasions. The world building is compact but imaginative. The story takes place in the far off future, but it doesn't shove it's theoretical technology down your throat. 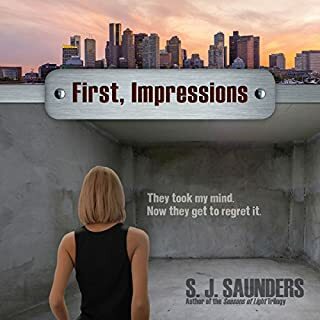 There is hopefully much more to be learned in the future installments; the second of which is already on Amazon but doesn't yet have an audio book. Hopefully Second, Ambitions (Last, Intentions Book 2) will become an audio book in the near future, but until then, don't miss out on this first installment. Favorite scene: Glyph introduces Claire to his creator's family. What does Shana Pennington-Baird bring to the story that you wouldn’t experience if you just read the book? This narrator is on point! Brings Claire to life in in the best way. :) Hope she returns for book 2.